WEDNESDAY, Nov. 12, 2014 (HealthDay News) -- A new study of more than 43,000 children finds that falls are the most common cause of head injuries among younger kids. For children under the age of 2, falls accounted for 77 percent of head injuries. For kids aged 2 to 12, falls caused 38 percent of head injuries, the researchers said. Many of these serious brain injuries result from car and bicycle accidents, said lead researcher Dr. Nathan Kuppermann, a professor in the departments of emergency medicine and pediatrics at the University of California, Davis School of Medicine. "Bike helmets and seatbelts can save your kid's brain," he said. Among kids who suffered a head injury in a car accident, fewer than half were wearing a seatbelt. 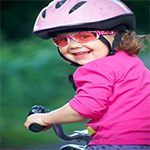 Children injured in bicycle accidents were wearing helmets less than 20 percent of the time, Kuppermann said. Among teens aged 13 to 17, head injuries were most often caused by assaults, sports and car crashes, the researchers added. The study did not include concussions, which are injuries that jostle the brain, but rather injuries that cause bleeding in the brain, he said. "The study gives a picture of how children suffer serious head injuries, and how often they get CT scans and how often they undergo brain surgery," Kuppermann said. The report was published Nov. 13 in the New England Journal of Medicine. Dr. John Kuluz, director of traumatic brain injury and neurorehabilitation at Miami Children's Hospital, said, "According to the U.S. Centers for Disease Control and Prevention, deaths among children from car accidents has dropped 40 percent." That decline is largely the result of seatbelts and air bags, he said. In addition, there are fewer severe head injuries being seen in emergency rooms. The majority of head injuries (98 percent) seen are "mild," Kuluz said. Among the children in the study, nearly 16,000 (37 percent overall) had a CT scan: 32 percent of those under 2 years of age; 32 percent of those aged 2 to 12; and 53 percent of those aged 13 to 17. Kuluz said that fewer CT scans are being done, especially among younger children whose brains are more likely to be damaged by radiation. In all, 7 percent of those who had CT scans had a traumatic brain injury and another 3 percent had skull fractures, the investigators found. The most common injuries were various types of brain bleeds, with half of the children having several types of head injuries. Among all the children in the study, 78 died (0.2 percent). Of the children with traumatic brain injury, 17 percent had brain operations and 43 percent of those had more than one procedure, the study noted. For the study, the researchers used data collected from 2004 to 2006 from emergency departments in 25 U.S. hospitals.